This is my second UM Draisine kit, the first being the Leningrad version ( offered as kit no. 604: see my review here). I thoroughly enjoyed building this kit and proceded to purchase the other three similar kits from UM, this being one of them. Once again a search on the web turned up nothing on this subject regarding any historical information or any specifications such as speed and range. 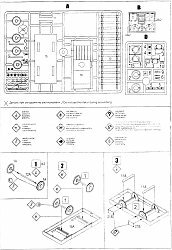 Everything I know about this kit's subject comes from the fractured English on the instruction sheet, which I have paraphrased below, along with a few comments from Ilian Filipov. Mucho thanks Ilian for your help. The BD-41 was designed from December 1941 to January 1942 at the Voitovich plant located in Moscow. 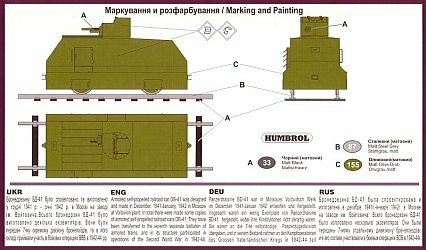 The hull was welded together using sheets of 8-10mm armour. A turret with a 37mm gun and 7.62mm DT machine gun from a twin turreted T-26 (M1931) tank was mounted to the top of the hull. The engine, gasoline tank, seats, ammunition racks and other special equipment was placed inside the hull. Crew consisted of 4-6 persons. Not all BD-41s followed the same pattern (Additional information from Ilian Filipov: About 20 were built and were based on written off T-40 tanks with engines beyond repair. 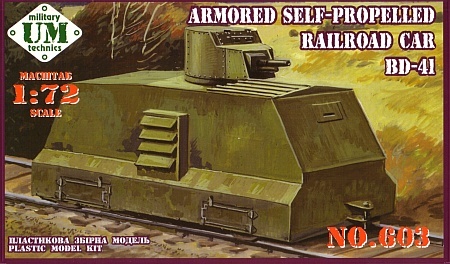 Their hulls (with the original turrets in most cases) were mounted on mass-produced inspection Draisine chassis and the lower part was additionally armoured. However, there was also a single Draisine that didn't follow the pattern and apparently it is the one represented by this kit.). 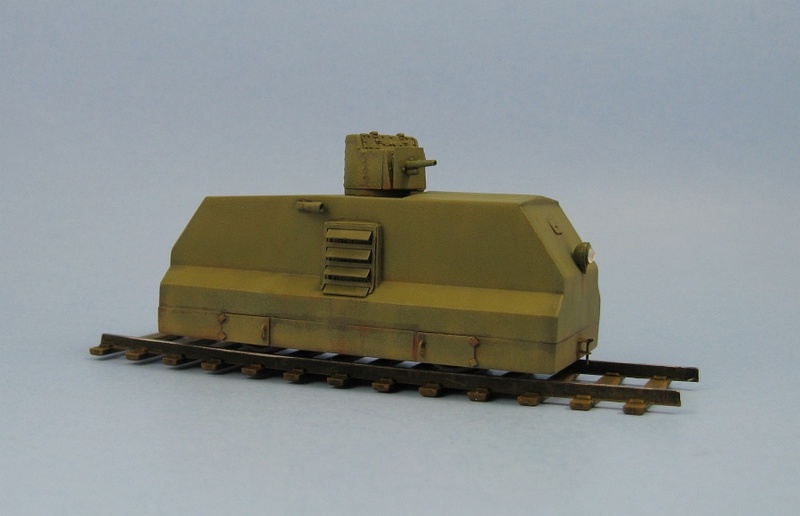 The BD-41s were assigned to the 7th Separate Battalion of Trains and were in operation from 1942-1944. The kit itself has 47 plastic parts in UM's typical medium hard, green plastic. 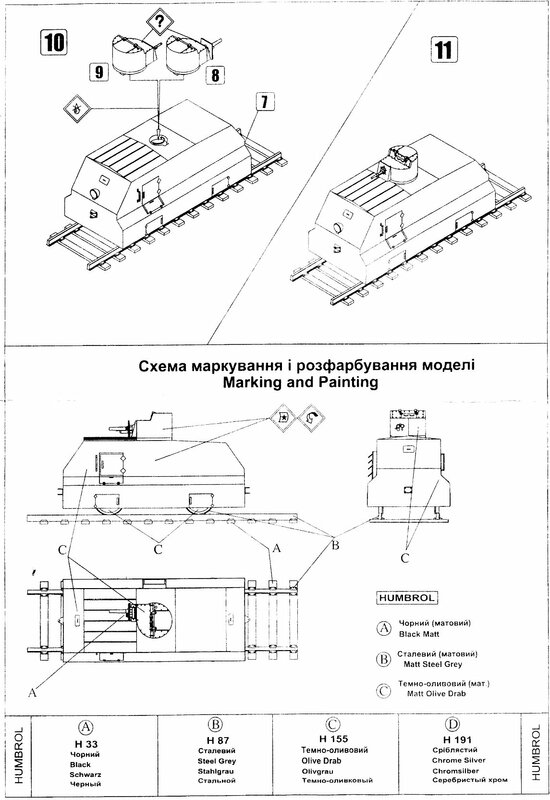 Twenty of the parts are not used and are crossed out with Xs on the sprue layout, but there are actually a few more that aren't used (parts for the second unused turret- D2, D5 and D3) and can be assigned to the spares box. 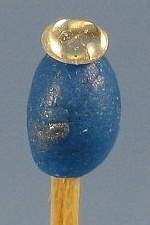 There is a photo-etched fret in copper consisting of 11 pieces. There is a generic decal sheet and of course an instruction sheet. As with the other Draisine kits from UM the construction is quite straight forward though there were a few areas that required some extra attention. First of all there are a few large sink marks that need to be filled. 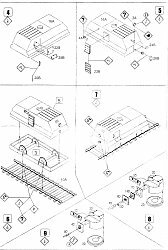 You'll find them on the underside of the lower body pan (part 15A) spanning the area between the wheel openings, as well as on both ends of the upper hull piece (part 16A). The photo-etched fret appear to be etched from copper sheet and once again is the worst part of the kit. The parts for the armoured windows, towing points and engine radiator louvers are quite useable since they employ the full thickness of the copper sheet, but the doors and wheel access panels were etched deeper into the copper in an attempt to create handles and hinges, resulting in parts that are too thin and warped. Since these parts were complete useless I replaced all of the wheel access panels and their associated hinges with scratch built items from plastic sheet. For the crew access door I just deepened the locating grooves for the etched pieces that was already engraved into the plastic hull. For some reason UM has the vertical lines engraved to the top of the hull, so these had to be filled with some putty. The hinges were separated from the etched doors and glued to the proper locations on the hull. I added handles from bent wire. The door handle comes as an etched piece (part 20B) but it was replaced after it broke while trying to bend it. The break was the result of my initially folds being too far past vertical and when I tried to correct the situation by folding it back to vertical the parts separated because the metal was too thin from the etching. 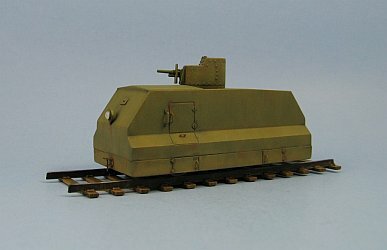 From previous experience building the Leningrad Draisine I replaced the weak plastic axles with some stronger axles cut from .049inch diameter piano wire. The wheels were super glued to the new axles and then the wheel assemblies were glued into their mounting groove in the bottom of the hull (part 15A) with some 1-minute epoxy to provide a nice strong bond. I cut out the opening for the radiator, backed it with some plastic sheet and inserted a piece of wire mesh. At this point I also discovered that the etched piece for the vents was larger, both in width and height, than the spot molded to the hull where it was to be placed. I remedied the width issue with some pieces of plastic strip glued to the perimeter. The height issue was more difficult to address. I added some more plastic strip to the top of the opening so I could shift the louvres up somewhat but it was not far enough to allow the lower louvre to completely clear the angled side of the hull. I could have raised this further up the side with more strips of plastic but I felt that it would place the radiator too high up the side of the hull. To get a better idea of what I'm talking about here, compare the louvres on the box top picture with what the finished model looks like. Not quite the same are they! The body parts are molded with a rough texture which I didn't like too much so the parts were sanded to tone it down some. The mounting of the hitches was a bit vague with no indication on the plastic hull where they should be placed, so I just made my best guess. They were easy to center though. I just had to use the coloured line on the hull from my body putty as a guide. Being photo-etched pieces I also figured they would also be quite susceptable to bending so I added pins made from bent wire and super glued them into the holes in the hitches for added strength. The shaft for the headlight looked a bit too short to fit properly so I decided to cut it a little closer to the sprue to give me some extra length for the shaft. Good thing I did because the shaft was indeed too short and the light would have aimed downward due to interefence between it and the hull. The headlight lens was made using a silver sequin with a dab of two part 1-minute epoxy to create the clear part (this idea was borrowed from Keith Goodman). I suspended the lens upside down while the epoxy set to ensure that gravity didn't flatten it too much. It worked quite well though under high magnification, like the macro setting on my digital camera, you can just make out some microscopic bubbles in the resin (see photograph to the left). Next time I'll need to mix it a little less vigourously. You get the choice of either a cannon armed or a MG armed turret. 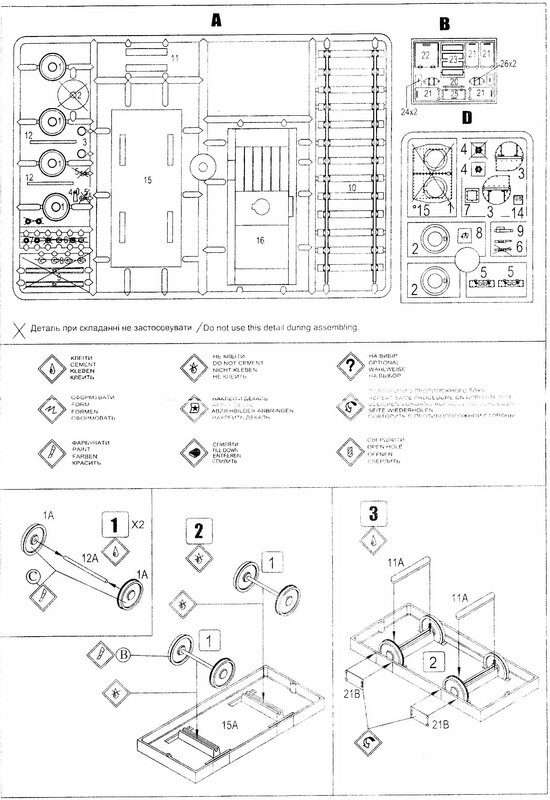 Depending upon which one you chose you can assign the parts for the other option to the spare parts bin. As far as I can tell you can ignore the fact that a machine gun is shown mounted co-axially with the cannon on the art work on the rear of the box. 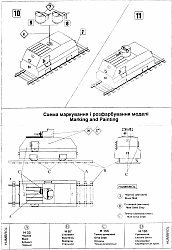 My few references show the T-26 turret was either cannon or MG armed, not both. The turret should be covered with rivets which this kit only partially has, so I decided to do another test run of my test method of applying missing rivet heads using thick super glue. Results are getting better each time I try this and soon I think it will be a great way to easily add missing rivets to model kits (I just need more practice to get them them a bit smaller and in a straighter line!). 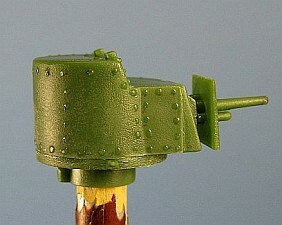 The cannon barrel and the horn (part 4A) were drilled out. 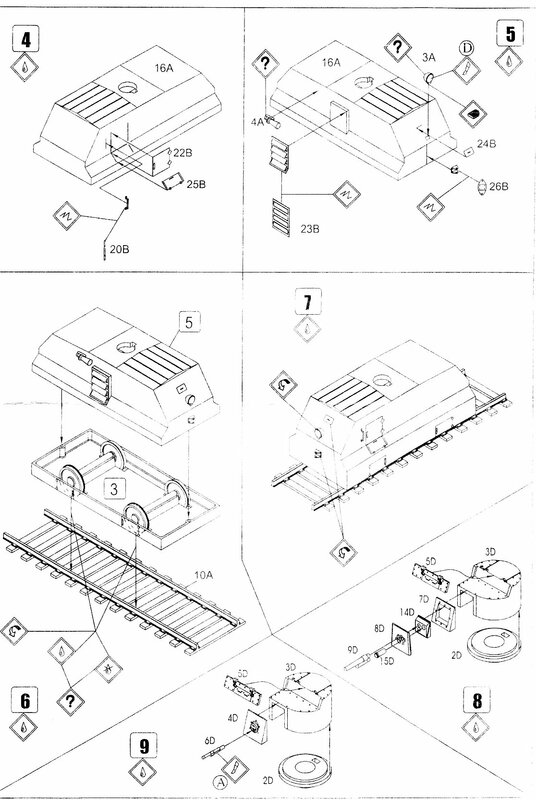 A short section of rail track is included. (I did not take a picture of it since I used one I had already finished for another project. 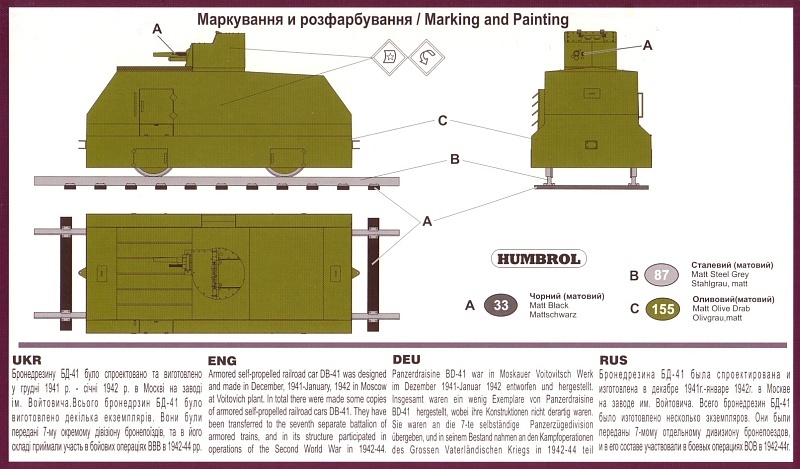 See my review on the UM Russian Railroad Lines). All my painting was done with enamel paints. The wheels were pre-painted with a coat of Krylon Gloss Black sprayed directly from the aerosol can. Before the primer was applied the wheels were masked. The primer was a coat of Testors light grey followed by a coat of Green Drab, which is quite dark. I then misted some Testors Russian Armour Green and Olive drab vertically over the body inside the panel edges to get a nice streaky finish. A coat of Testors Glosscote was followed to level the coats and followed with some pin washes in black to the panel lines and so forth. Since I use enamels lots of dry time is required before applying the washes. Then some dry brushing with Aeromaster Earth Brown was done once the wash was thoroughly dry. A final misting of some Aeromaster Earth Brown along the bottom edges and some Testors Rust dabbed here and there completed the painting process. There are no instructions on what to do with the decals so they too found their way into the spares box. 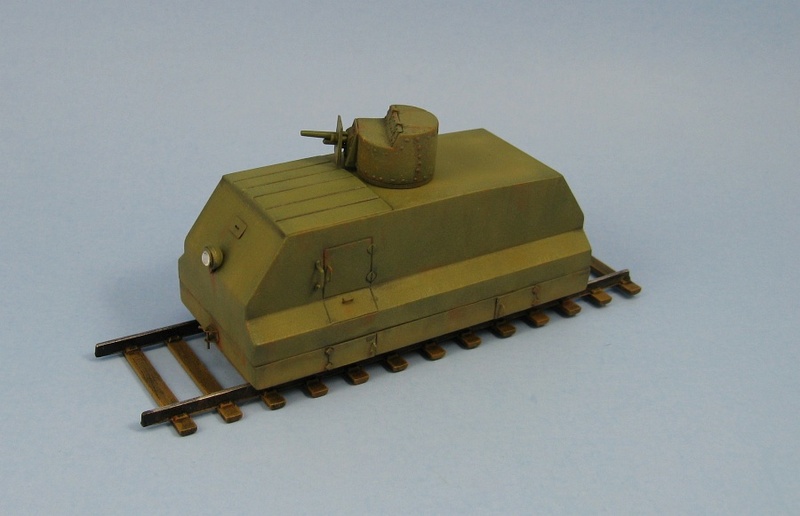 Outside of the extra work to replace the photo-etched pieces and the problems with the axles, this was a fairly quick build and was quite enjoyable. I have the two other UM Soviet Draisines to build and hopefully UM will actually follow through with the German Panzer Draisines that are shown as future releases in their 2010 catalogue.